With over 35 years’ experience in construction projects management that includes EPC Construction Management, EPCM Project and Construction Management, and now working as a Pipeline Management Consultant I have witnessed first-hand why constructions projects fail including some of the worlds mega projects. All too often a major cause is inexperienced and unqualified project management teams. Managers at all levels are poorly selected from in-house resources, or through external recruitment and sometimes friend-of-a-friend who are then plunged into the project management maelstrom. They lack project management training, decision-making ability and are not able to communicate effectively within a project team environment. Team members may have the required technical ability in their particular discipline but that falls well short of the competencies required to manage and successfully deliver projects. Included below is a matrix on “causes of project failure,” which is by no means exhaustive as numerous other factors with a disposition to produce failure are not considered - change management, management of change, influences related to value of change, risk management, crisis management, communication, etc. Moreover, the decision-making abilities necessary for adaptation when faced with difficulties. “These lists will not come as a shock to anyone with experience on major capital projects. The important item to note is that while many project stakeholders can tell when something is not going well on their own projects, many do not notify management because they believe the problems or issues are temporary and will eventually be addressed”. Construction projects are complex endeavours that have a high probability of failure without proper construction execution planning, coordination and control. 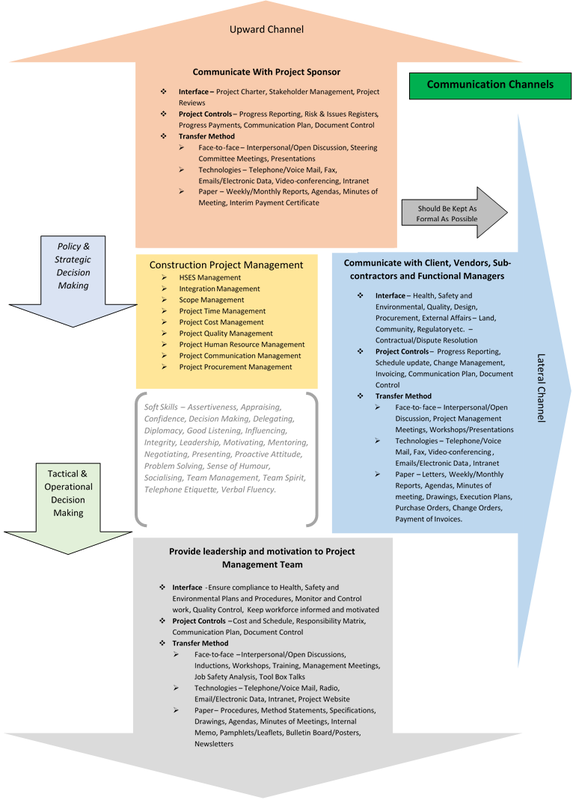 Construction Management, when done correctly, employs a structured approach of processes and procedures to measure and document progress, which is essential in terms of cost and schedule management for determining project performance. However, there are many other aspects to project construction management other than functioning within what used to be known as the triple constraint of scope, time, and cost; with the contemporary exemplar assimilated with quality as a core consideration. Construction, and especially pipeline construction management, has in addition to the old paradigm, other equally important constraints that have to be well-managed in order to achieve a favourable project outcome. These include Stakeholders, Health, Safety, and Environment, Resources, and Client Satisfaction but Regulatory Authorities and many other influences may have a positive or negative impact to project success. Behaviour-based management is also very important. Clearly, the project manager has to be able to develop a team with the right skill sets, lead and motivate them. However, the team must be given the level of accountability and responsibility to feel valued and want to take ownership of their assigned tasks. This is absolutely essential to enhance performance. Good communication flows from teams performing well together while derision and internal conflict are common symptoms of a team micro-managed. At PCM Ltd we know all the pitfalls associated with project failure because we are seasoned professionals with years of international project exposure and subsequently possess the wisdom and capability to carry out well-organised construction project management using proven tools and techniques supported by unparalleled industry experience that is tailored to client needs. We offer a value for money, pragmatic and unbiased service to administer and accomplish an effective final product.